I’ve never been a journaler. Unusual for a writer, I know. I suspect it’s because I’m much more interested in what my imaginary characters will do next than in what boring me has already done. That’s kind of based on real life. For instance, in the 1990s, I worked as a figure skating researcher and producer for shows on ABC, ESPN, TNT and NBC. Then, from 2002-2006, I wrote a series of murder mysteries for Berkley Prime Crime – that featured an intrepid, figure skating researcher for the 24/7 Sports Network. Last year, the novels were republished as enhanced e-books, meaning that, along with the text, I included footage from The Ice Theatre of NY that complimented the story. (For a sneak preview of how that would work, click here. This January, all five titles, “Murder on Ice,” “On Thin Ice,” “Axel of Evil,” “Death Drop” and “Skate Crime” were released as a single volume, “The Figure Skating Mystery Series”. In order to match the available skating videos to relevant scenes in the books, I had to go back and re-read works I hadn’t given much thought to in almost a decade. And here is what I discovered: I may not be much of a journaler, but those books were a de facto equivalent of a journal, as I came across incidents and descriptions based on real life… that I’d completely forgotten about. At this particular event, it all started with the information wall. Since the 24/7 staff was so large, and since all of them worked on such wildly different schedules (not that any of them worked less than the bare-minimum eighteen-hour day, but they didn't all begin and end at the same time), the information wall was set up as the place they could turn to at any time to pick up the latest information and bulletins. The PAs took legal-sized manila envelopes and taped them to the wall, like large, hanging pockets. Each envelope was labeled to indicate its contents: Directions to the Arena, ISU Communications, Judge's Draw, Ladies' Results, Men's Results, Pairs Results, and Dance Results. Except that, on this show, the PA in charge had made a mistake, and written instead: Pears Results. It was a boo-boo no self-respecting joker could pass up. The next day, a new envelope went up on the wall, labeled "Peaches Results." It was joined less that twenty-four hours later by an envelope labeled: "Picasso's Draw," an abstract crayon doodle hanging out to drive home the point. Next, up went: "Quick Draw McGraw." Then, "Draw Binky and get accepted to art school!" It probably was only funny to the sleep-deprived and skating-overloaded. So naturally, the staff of 24/7 found it absolutely hilarious. The above actually happened. 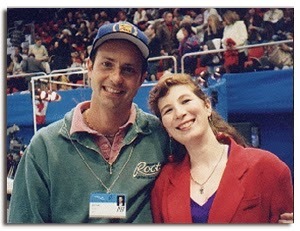 In Paris in 1997 at the European Figure Skating Championship. I remembered it when I wrote “Murder on Ice,” but, since then, the memory had completely slipped my mind (having three kids in the intervening years will do that). I was nervous to re-read the Figure Skating Mysteries after so much time had passed. I knew that I was a much better writer now than I had been then (or, at least, I hoped so). And, I’ll be honest, I found a few clunkers upon re-reading that I can’t believe an editor at a major, NY publishing house let pass. I was a little bit embarrassed – the way anyone would be looking at an old photo of themselves wearing what they’d then been sure was the height of fashion.